I looked for a new podcast from Lime and Violet, but it's not showing up in iTunes yet. I liked a couple of songs from Duffy, but Estelle not so much. Leona Lewis is one of my new downloads, too, as well as Sigur Ros, Maire Brennan, Dar Williams and Sara Evans. A friend of mine gave me a CD with songs by French Canadian folk singers, I wish I knew the title of the songs and who was singing them. I will begin researching it this weekend, hopefully I'll find more info. They really touch my heart. I am so glad that you are receiving some recognition - you are so talented. Congrats on the 2 minutes of fame - you deserve it! Your scraves are so amazing. That is indeed a very lovely scarf. Beautiful scarf! 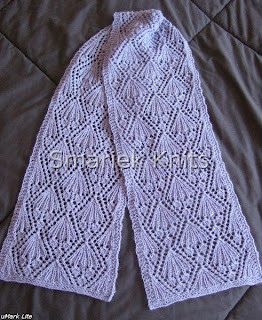 I've long admired that stitch pattern, but never tried knitting it. You've used it to lovely effect.